Iran and Turkey are engaged in a contest for supremacy in northern Iraq, even as the fight against Islamic State continues. The most intriguing aspect of the Mosul campaign, however, has been the differing and often opposing agendas of the various components of the attacking force. These, with surprising rapidity, have now have come to the fore. Just two weeks into the offensive, two of its most prominent backers – the Baghdad government of Prime Minister Haider al-Abadi and the Turkish government – are engaged in a war of words. How has this crisis emerged, and what may be the direction of events in the next phase? The Shi'a militiamen of the Popular Mobilization Units, or Hashd al-Sha'abi, are currently heading toward the town of Tal Afar, population 100,000, located 60 kilometers west of Mosul. Their mission will be to capture the town and prevent Islamic State fighters from escaping westward toward the Syrian border, on the highway adjoining it. The PMU consists of around 40 Shi'a militias. The most significant of these are directly supported by the government of Iran. The three most important militias in the PMU are the Badr Organization, the Ktaeb Hezbollah and the Asaib Ahl al-Haq group. All three are pro-Iranian and the recipients of direct training and assistance from Tehran's Islamic Revolutionary Guard Corps. The militias make little secret of their nature and goals. A Badr officer interviewed by this author in Baghdad in the summer of 2015 declared that his hope for the PMU is that its role in a future Iraq would be similar to that played by the IRGC in Iran. 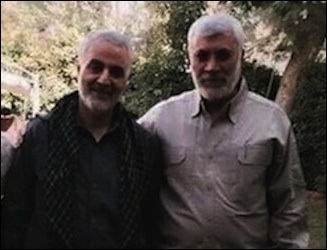 PMU leader Abu Mahdi al-Muhandis (right) with Iranian Quds Force commander Qassem Soleimani. The two most powerful figures in the PMU, Hadi al-Ameri of Badr and Abu Mahdi al-Muhandis of Ktaeb Hezbollah, are both veteran Shi'a Islamists and close associates of Gen. Qassem Soleimani, who commands the expeditionary Quds Force of the Revolutionary Guards. The Shi'a militias of the PMU are thus a classic Iranian production – combining political, military and paramilitary/ intimidatory roles for the maximization of power and Iranian influence. They are also deeply hooked into the centers of power in Iraq. Badr, in its political guise, is a member of Abadi's government. The militia also holds the governorship of one of Iraq's provinces, Diyala, where it dominates the official security forces. In the Mosul offensive, however, the Iranian project for wielding power via proxy is colliding with a rival project of a similar nature, maintained by President Recep Tayyip Erdogan of Turkey. The Turks established a military base at Bashiqa, east of Mosul, in December 2015. There, Turkish officers engaged in the training of a Sunni militia. The militia was organized by Osama al-Nujaifi, a former parliament speaker close to the Turks, and by his brother Atheel, former governor of Nineveh province. 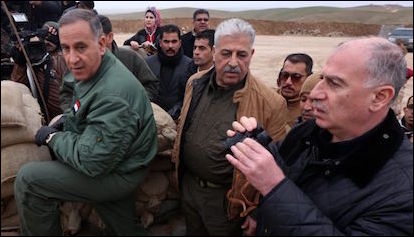 Osama al-Nujaifi (right), his brother Atheel (center), and Defense Minister Khalid Al-Obaidi at the front last year. The Nujaifis have come out in favor of an autonomous Nineveh province, once Islamic State has been defeated. Clearly, the intention is to build Turkish and Sunni influence in northern Iraq. 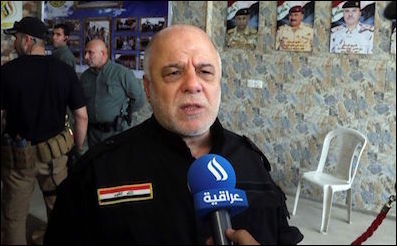 Abadi, while opposing the Turkish effort, has tried to take a moderate approach. His guarantee that the Shi'a militias would play no role in the fight against Islamic State in Mosul formed a part of this. But for the militias themselves and those that back them, the Turkish gambit must be opposed. 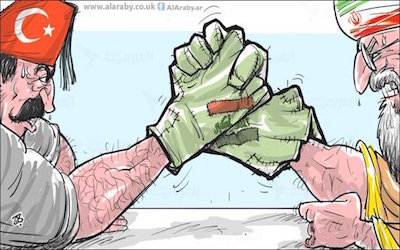 The Iranians and their allies are already engaged against Turkish-supported militias in northern Syria. For them, the battle in Iraq is part of the same fight. Tal Afar, meanwhile, is of particular importance, not only because of its location but also because of its history and demography. An old Ottoman garrison town, its majority Turkmen population is a remnant of the days when Iraq was part of an empire ruled from Constantinople. The population is divided into Shi'a and Sunni Turkmen. Its Sunnis were pro-Saddam, and furnished the old regime with many recruits. Many later also joined Islamic State. Much of the Shi'a population was driven from the town when Islamic State took it in 2014. The Shi'a militias may now be seeking revenge. Iraqi Prime Minister Haider al-Abadi warned recently that Turkish military intervention in Iraq will lead to the "dismantling of Turkey." Turkey has now deployed tanks and artillery in the Silopi area, close to the border with Iraq. Erdogan warned last week that Turkish forces would intervene if abuses were committed by the Shi'a militias against the Sunni residents of Tal Afar. The Iraqi government is taking the threat seriously. Abadi said this week that while Iraq does "not want war with Turkey, and we do not want a confrontation with Turkey," if Erdogan's forces invade, this will lead to the "dismantling of Turkey." So how will this game of brinkmanship play out? At this stage Erdogan's words seem designed more to exert pressure than to signal an imminent intervention. As long as the militias avoid a sectarian bloodbath in Tal Afar, the Turkish tanks will probably remain on the border but not cross it. But the ongoing tensions between Ankara and Baghdad/Tehran show that even as the fight for Mosul city has not yet reached its expected height, the various players are already competing for supremacy in the aftermath. As of now, the Iranians have the overall better hand. Their experience in the use of proxy forces is longer than that of the Turks. They are allied with the central government in Baghdad. The US and the West perceive little danger in their activities in the post-nuclear-deal era. The Turks, however, have demonstrated in northern Syria earlier this year a willingness to employ their own forces in bold but risky gambits on the fragmented territory of their neighbors. Iranian- Turkish and Shi'a-Sunni rivalry are at the heart of the struggle for power in Nineveh province and further afield. The meaning of all this is that northern Iraq has ceased to function as a sovereign territory. Other forces – Turkish soldiers, Iranian Revolutionary Guards, Kurdish guerrillas, Shi'a militiamen, Sunni jihadists – are now engaged in a battle over its territory and resources.